« Suiting Up Rock Stars! November has come to a close, and with it the Movember, a month of mustache growth in order to raise awareness and funds for male cancer. 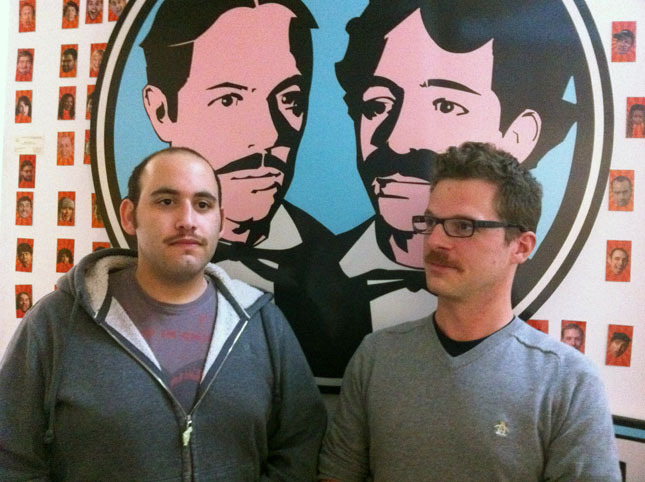 JibJabbers Bennett and Anthony both jumped on board the initiative and grew two handsome mustaches this month, enduring much ridicule and awkward stubble along the way. Together they’ve raised $600 thanks to their facial hair feats, we ask you to push it over the top and please consider a donation to the cause! Click here to donate to Anthony (left) and here to donate with Bennett (right). Proceeds benefit the Prostate Cancer Foundation (www.pcf.org) and LIVESTRONG (www.livestrong.org). Our MoBros thank you from the bottom of their hairy hearts! This entry was written by paulhanges and posted on December 1, 2010 at 1:23 pm and filed under Inside JibJab, Team JibJab. Bookmark the permalink. Follow any comments here with the RSS feed for this post. Trackbacks are closed, but you can post a comment. i am so glad that the money is being donated to the prostate cancer foundation since this is all about prostate cancer, but in my experience the laf doesn’t do much AT ALL to promote awareness for prostate cancer at all.